Abe and Putin on Saturday are scheduled to hold their 21st face-to-face meeting. The prime minister said he hopes to move ahead with planned joint economic activities on the Russian-held islands off Hokkaido, which were occupied by the Soviet Union at the end of World War II and are claimed by Japan. The government sees the planned economic activities on and around the isles, which are called the Northern Territories in Japan and the Southern Kurils in Russia, as holding the key to resolving the long-standing dispute. The row has prevented Tokyo and Moscow from signing a peace treaty to formally end the war. Abe and Putin agreed in 2016 to jointly carry out economic projects under a special framework that will not undermine their respective legal positions on the islands’ sovereignty, but no real progress has been announced since. A high-ranking Foreign Ministry official, who declined to be named, said earlier this month that both Japan and Russia anticipate they will achieve progress on the projects during the summit. But James D.J. Brown, an associate professor who specializes in Russian foreign policy at Temple University, Japan, said that significant progress is unlikely, explaining that the legal framework for the activities must be decided first. “Going back to when this was first agreed in December 2016, the Abe administration seemed very happy because they felt they had the agreement that this was going to take place under a special legal framework that was going to be different from Russian law,” Brown said. But more recently, Moscow has consistently said that any framework has to conform with its laws, he added. None of the planned activities can happen “unless they can actually make the legal agreement,” he said. Aside from the joint economic activities, the two leaders are expected to discuss the eight-point cooperation package, which Abe proposed in 2016, covering such areas as health care, energy and urban development, according to a government source. Abe said Thursday that the two leaders will exchange views on how to deal with Pyongyang in the run-up to the potential U.S.-North Korea summit, scheduled for June 12 in Singapore, and that he will seek an agreement from Russia to allow former residents of the islands to conduct ancestral grave visits again this year, following the first such trip in September 2017. In an abrupt turn of events, Trump, however, said later in the day in Washington that he has called off his landmark meeting with Kim. 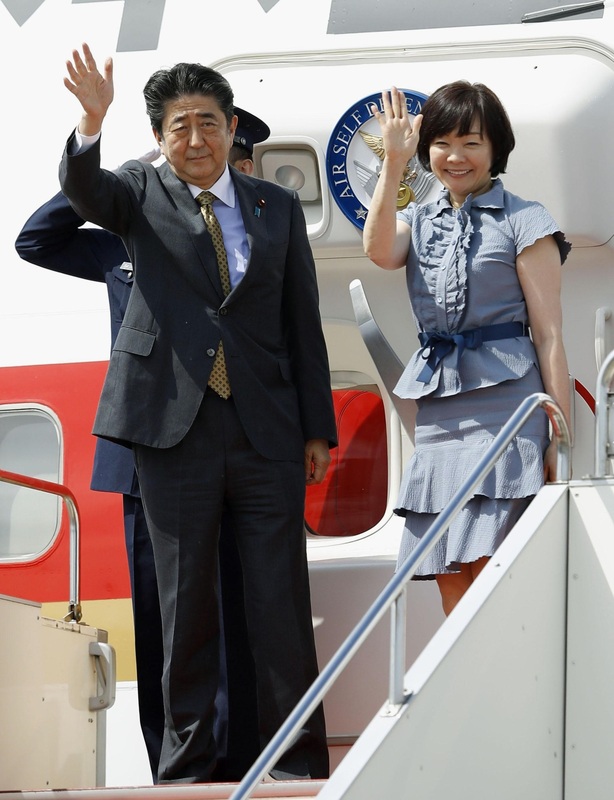 Abe is scheduled to participate in the St. Petersburg International Economic Forum on Friday with Putin. French President Emmanuel Macron is also planning to attend. On Saturday, Abe is set to attend a ceremony where an Akita puppy will be given from the Akita Dog Preservation Society to Olympic figure skating champion Alina Zagitova. Updated: This story was updated on May 25 to include developments regarding Trump’s cancellation of the summit with Kim in Singapore.